I’ve known them both for ages, and always admired the refinement, focus, and cohesiveness of their design and their long-range viewpoints. I worked with Richard at Metropolitan Home in its glory days. I was introduced to James some time ago by the great Estée Lauder exec Marianne Diorio. Both of these exceptional design talents, work in the heart of Manhattan and at the center of top worldwide brands. You can read more about their company biographies at the end of this design post. 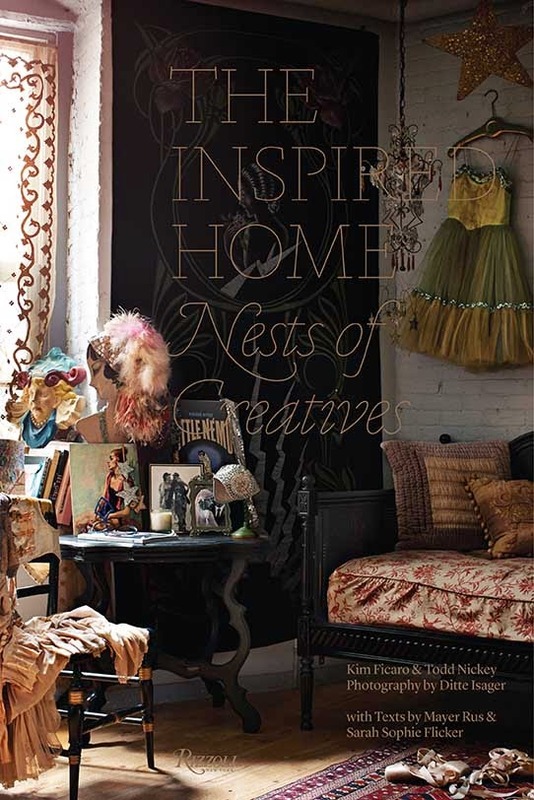 Now, in a brilliant new book, THE INSPIRED HOME: Nests of Creatives, by Kim Ficaro and Todd Nickey, with texts by Mayer Rus and Sarah Sophie Flicker, I was pleased to discover the refined and inspiring country residence of James and Richard. The 208 pages of this highly original book are filled with original, bohemian, quirky and expressive and wildly personal interiors. 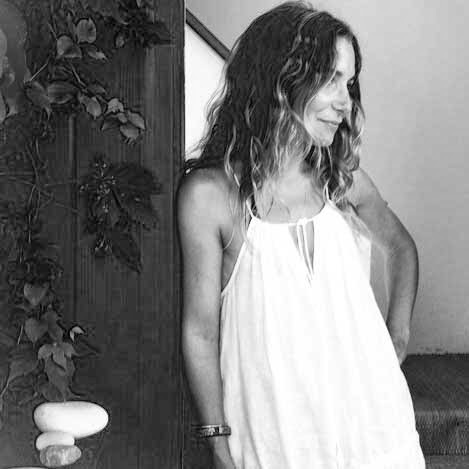 There are lofts, weekend cottages, villas, apartments, retreats, studios and lairs of artists, stylists, designers and talents like Moby, John Derian, Doug Lloyd, Douglas Bensadoun, Christine Rudolph, and Vincent van Duysen. But it is the crisp and tightly edited interiors of the Pennsylvania property of Ferretti and Gager that leap off the pages. I love the precision, the superb editing, and the cool air of tranquil timelessness they’ve created. The house and barn were built in 1700, with an addition of a George Nakashima room in 1949. This is where the two designers escape every Friday night. 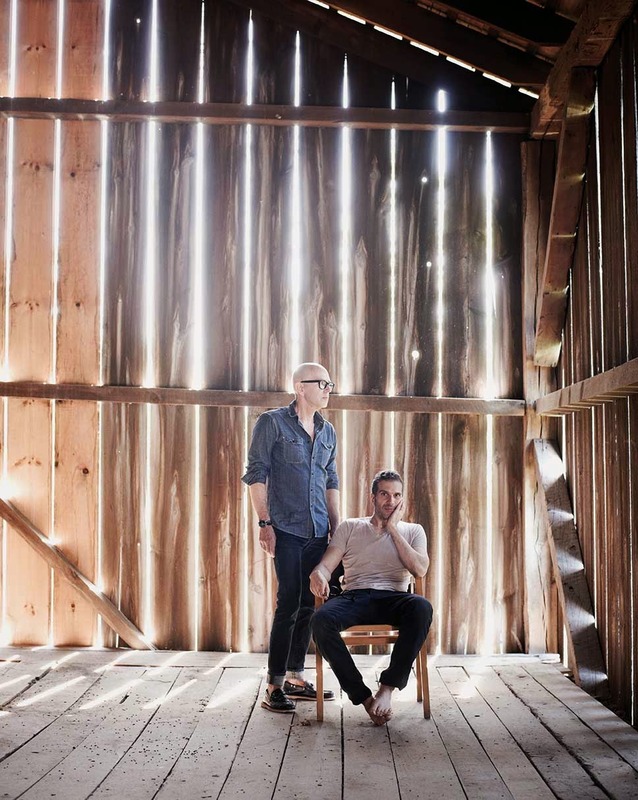 Come and meet this talented pair and visit their Doylestown weekend retreat—and learn from their style, their editing, and their love of zen interiors. “It was indeed in spectacular disarray,” recalled Gager. Six others bid on the house, but the couple felt that it was meant to be theirs. “The original owners had adored this house, and now it is beloved by us,” he said. “This is our brains on ‘tradition’,” said Ferretti. 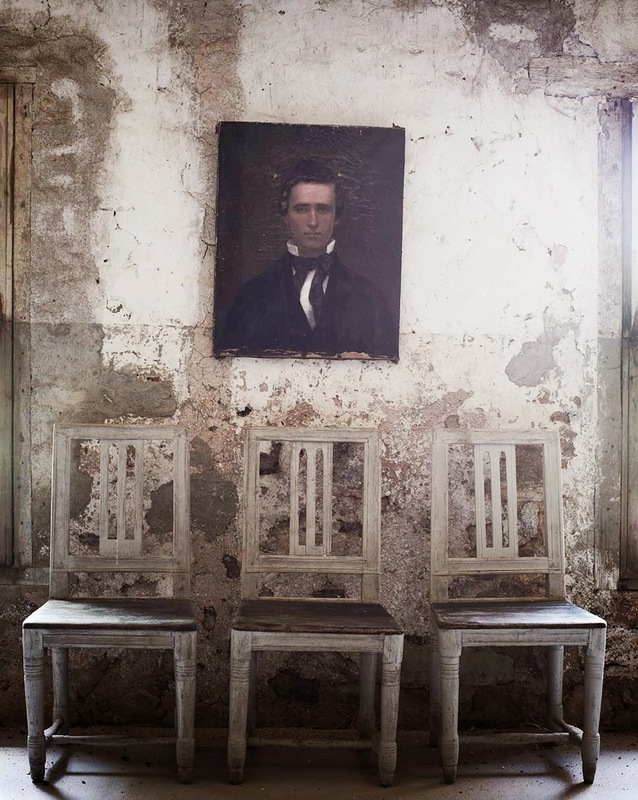 It’s a nod to the history and classicism of the stone house and the old barn.” A trio of Gustavian chairs attends a formal portrait in the barn’s basement. “We are not capable of pure country style,” said Gager. “It is just not going to happen.” In their root cellar they composed a wallpapering table, and the spark and gloss of a sculptural modern chair. The six-acre property Gager and Ferretti acquired is situated five minutes from New Hope, in Eastern Pennsylvania, and is just across the New Jersey border. Their drive time on Friday night is about an hour and a half. Ferretti noted that they were inspired by the simplicity and monochromatic approach of Jacques Wirtz and other Belgian landscape designers, and one section of the garden is planted in grasses, and another is a sea of ferns. 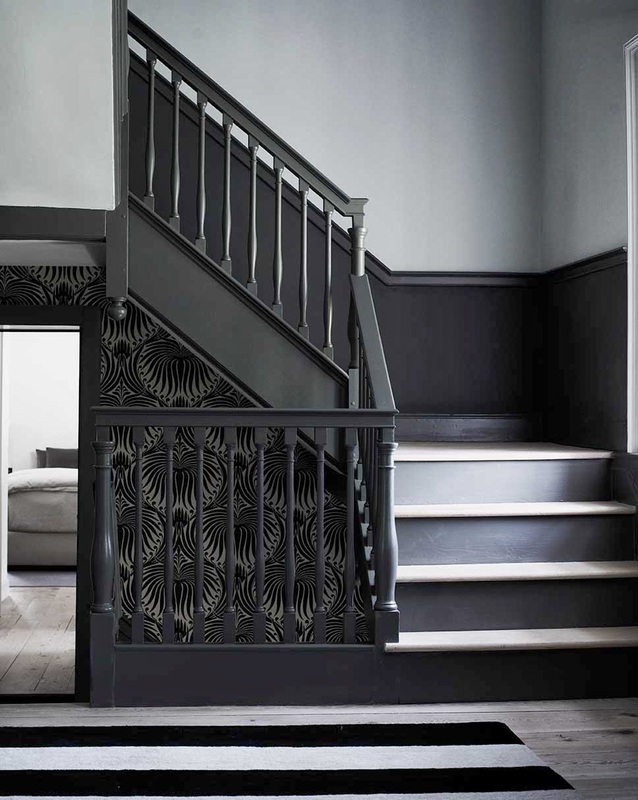 The stair balustrade was painted in Benjamin Moore’s ‘Kendall Charcoal’. 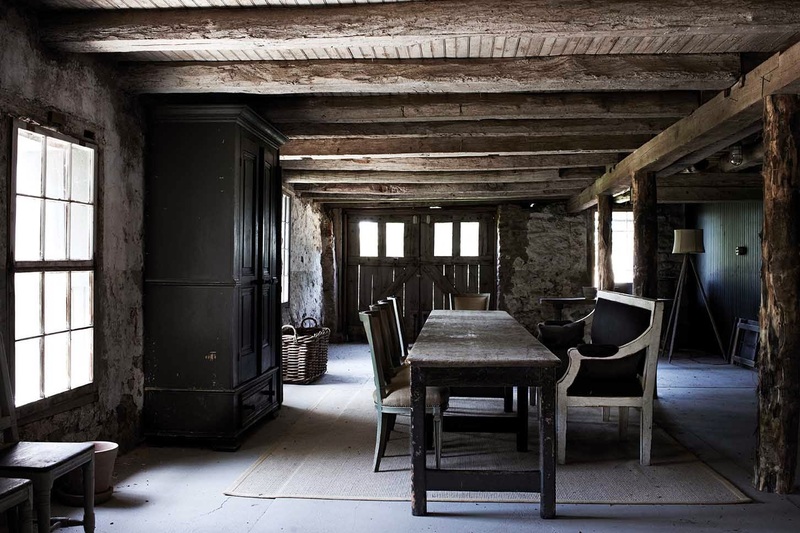 Floors throughout the residence were stripped and waxed with a hint of white to keep the centuries-old look. For this couple, the rooms are about purity, composition, light and shade, and restraint. 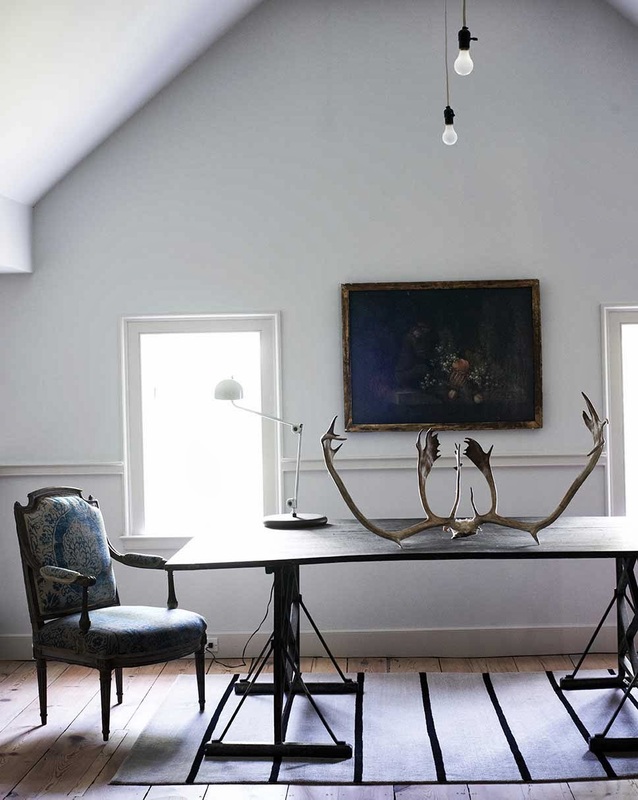 In the upstairs living room, a tableau of simple objects bepeaks the couple’s love of the authentic. Windows of the upstairs guest bathroom are shaded by massive oaks in the six-acre property. The bath is burnished steel. I asked Estée Lauder execs to kindly send me the company biographies of James Gager and Richard Ferretti. It’s exciting to see their accomplishments and collaborations. And it’s inspiring to see that their lives have always been devoted to art direction and product and creative concepts. I hope my design student readers, and dear readers starting their design / art/ style careers—will be very inspired by the paths they’ve taken, the companies they’ve worked for, and their steady rise and decades of hard work and collaboration. Each of them was art-obsessed as a young person—and their passion for design, ideas, trends, and pioneering concepts is evident today. These bios offer an insight into their work week, the high-profile talents they work with, and the pace of their days. In contrast, their Pennsylvania barn and residence and gardens take them to a tranquil realm. Come and get to know James and Richard. James Gager was born in Niagara Falls, New York, and he has worked with the expectation that art and life should thrill; that aesthetics must always engage and even produce a little adrenaline. All Ages, All Races, All Sexes mantra. Mr. Gager chose them for their style, heart and soul. To create M·A·C’s pictures, he has worked with Steven Klein, Tim Walker, Hiro, Sølve Sundsbø, Richard Burbridge, Mert & Marcus, and Miles Aldridge, as well as with numerous illustrators. Under Mr. Gager’s guidance, M·A·C produces over 40 collections and how-to videos a year featuring downtown celebrities and world-renowned makeup artists. He has engaged high-profile photographers David LaChapelle and Michael Thompson to shoot the VIVA GLAM campaign, which is based on a lipstick that supports people living with HIV and AIDS. In the tradition of M·A·C, Mr. Gager began with music celebrities – Shirley Manson, Lil’ Kim, Mary J. Blige, and Elton John – and ultimately widened M·A·C’s vision to encompass artists in other disciplines including Chloë Sevigny, Linda Evangelista and Dita Von Teese. The choice of Lady Gaga (before “Poker Face” hit the charts) resulted in the most successful campaign to date. He has essentially taken what was a grassroots campaign with a drag queen, RuPaul, to international acclaim. “M·A·C, for me at this point of my career, is a really different experience because I have a lot of creative autonomy,” says Mr. Gager. Before coming to M·A·C, Mr. Gager was the image guru behind Estée Lauder’s Prescriptives for 20 years, refreshing the beauty and skincare business with programs like Colourprinting and Virtual Skin and infusing the brand with a distinctive personality. John Demsey credits Mr. Gager with having a cosmic antenna, an ability to foresee trends that are cutting-edge and rich with commercial potential. Mr. Gager views his recent election to the Board of Directors of the M·A·C AIDS Fund as a highlight of his career, as important as any design award. In addition to his responsibilities at M·A·C, he assumed the role of Global Creative Director for Jo Malone London and La Mer in 2010. Mr. Gager received his Bachelor of Industrial Design and a Master of Science in Package Design from Pratt Institute in Brooklyn, New York. Richard Ferretti is Senior Vice President and Global Creative Director for Estée Lauder, a position he has held since October 2011. As a creative visionary with a fresh, dynamic perspective, Richard leads all creative and visual aspects for the Estée Lauder brand globally, including TV, digital and print advertising, packaging, visual merchandising and store design. 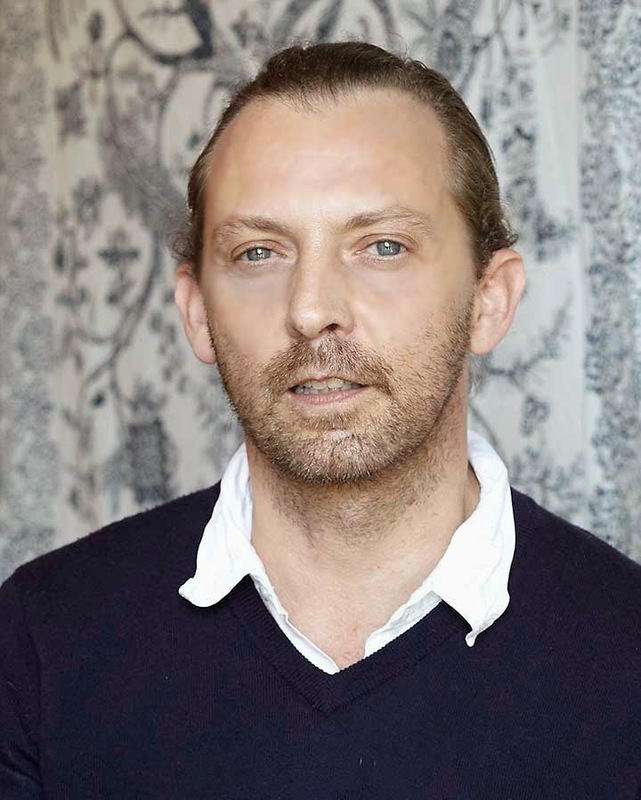 In this role Richard works closely with Jane Hertzmark Hudis, Global Brand President, Estée Lauder as well as Aerin Lauder, Style and Image Director, Estée Lauder. Over the course of his career, Richard has been the creative force behind major brands, magazines, retailers, and books in the fashion, beauty and lifestyle arena. Before joining Estée Lauder, he served as Creative Director of the Coach and Reed Krakoff brands. At Coach, Mr. Ferretti was responsible for directing the global image of the brand’s leather goods and fragrances through advertising, catalogs, digital assets and retail stores in key markets such as, the U.S., U.K., China and Japan, and incorporating the Coach heritage in a visually-compelling way. At Reed Krakoff, he was responsible for the creative development and visual imagery that launched the brand in 2010. Prior to that, he served as Creative Director at Gourmet Magazine, where he was credited for bringing a fashion sensibility to the magazine’s design. He also served as Creative Director for Banana Republic (Gap Inc.) and held senior design positions at publications including Metropolitan Home. Mr. Ferretti has also designed 15 luxury lifestyle books. ‘THE INSPIRED HOME: NESTS OF CREATIVES’ by Kim Ficaro and Todd Nickey, with texts by Mayer Rus and Sarah Sophie Flicker, is published this month by Rizzoli. In this new book, Ficaro and Nickey—deeply involved in the creative worlds of New York—have gathered a worldly roster of talented and ingenious (and home-loving) ‘creatives’. Their pals in the field and friends of friends in the book include stylists, artists, architects, editorial stylists, fashion designers, a photographer, as well as creative directors like Gager and Ferretti, featured here. The interiors shown in THE INSPIRED HOME are highly diverse and diverting. Those ‘at home’ include art directors who plan and style and direct the visuals for catalogs or marketing programs (think IKEA) as well as photo stylists for fashion companies (Aldo shoes) and furniture designers, a potter. Few are big names in decorating, but their style, collections, editing, and eccentricity shines through. If you love the comfort, aesthetic and power of ‘imperfection’ this is your book. 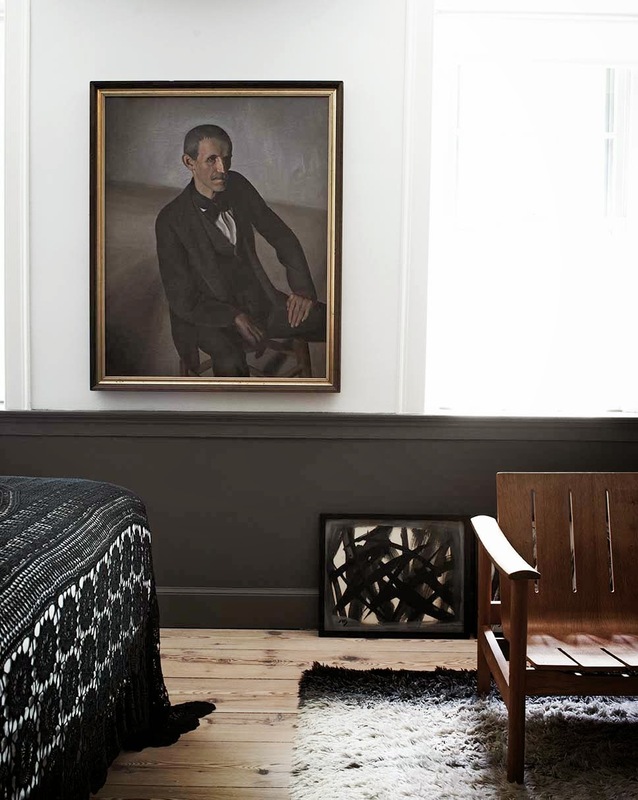 Photography published here, from ‘The Inspired Home’, is used with the express permission of Rizzoli. Thank you for this excellent article on two talented men. I was so very fortunate to be chosen by Mr. Gager as one of the six 'MAC Me Over' winners in 2011. I will never forget the exhilaration of that.